White-coated lighting board with 2 long-lasting, energy-efficient, extra bright white LEDs, and an integrated voltage stabilization circuit; works with DC (0-24V) and DCC (0-24V); suitable for installation in almost all LGB® passenger cars. The reflective surface of the board directs the output of the LEDs to the inside of the passenger cars effectively. A warm light fills the model passenger cars nicely with minimal power consumption. 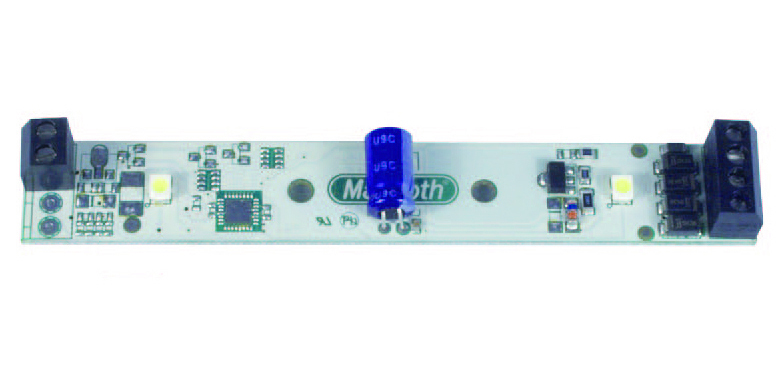 The boards can be connected to terminals A2 and A3 of Massoth's Digital LED lighting boards (Product number 8122001), and have their lights switch on and off by function keys F2 and F3. Special lighting effects such as dimming, and simulation of fluorescent tubes or gas lights can be obtained with boards connected to terminal A2 of the Digital Board. The Analog LED Board can be mounted with screws in the roof of any passenger car that provides two properly spaced mounting holes. The board can also be mounted with double sided tape. Copyright © 2011 - 2018 AllAboutLGB.